We’ll take riders on a tour through our historic buildings downtown and highlight the amazing historic elements of them. We’ll also visit one of the only two LEED Platinum buildings in El Paso. We’ll start at the Abdou Building then head to Tays, the Magoffin Home, and Project VIDA. As an exciting finale, we’ll end our ride in front of the Convention Center, where we’ll be celebrating El Paso’s 145th Birthday and our designation as an #AllAmericanCityFinalist. Join us for drinks and a good time with fellow architects, engineers, cyclists, historic preservationists, and more! The total ride length will be able 7 miles (with multiple stops) and we’ll travel at a leisurely pace. 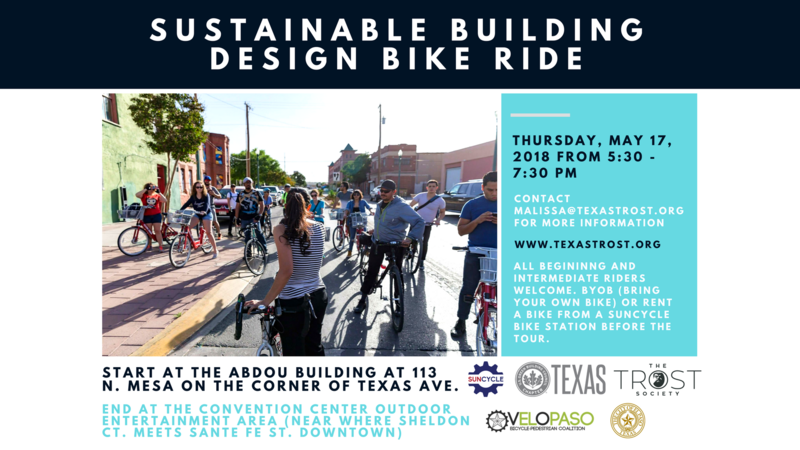 This ride is part of #elpasobikemonth and #historicpreservationmonth and is a special edition of our monthly #GreenDrinks event! It’s all coming together so don’t miss out!! Donations are always welcome and helmets and water are highly recommended!